Left to right: Andrew Rothwell. Franio van Wyk, Alex Hale, Ella Newman and Michael Wise. Barton Peveril students competed in the Blott Matthews Pole2Pole Challenge final, on Saturday 23rd March. The two Barton Peveril teams both received special merit prizes and each received £100 in prize money. 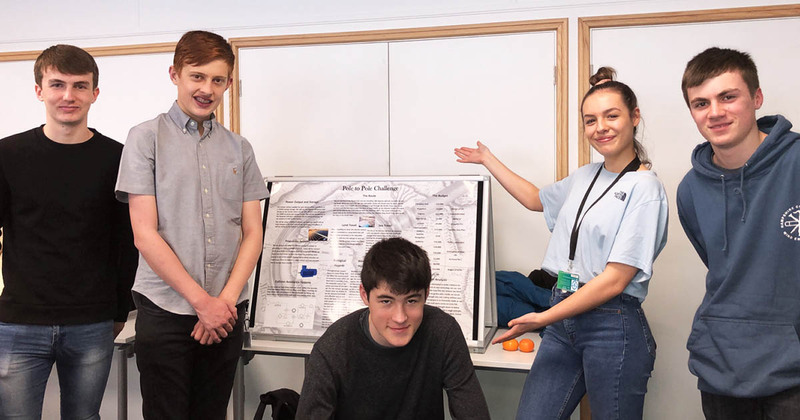 The Blott Matthews Pole2Pole Challenge is an engineering competition, where students have to find a way to transport a one tonne load from the North to South Pole without the use of flight, external assistance or refuelling. Franio van Wyk, Ella Newman, Alex Hale, Michael Wise and Andrew Rothwell.